A challenge for developing countries is to enter the global economy. This is impeded by weak infrastructure, poor educational and other formidable barriers as these countries embark on essential projects to improve living standards and ultimately create some sort of technological base. 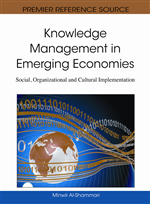 This chapter describes perceptions of knowledge-based technology management in Afghanistan, one of the poorest and least developed countries in the world. Afghanistan’s politics and history have always confronted managers with unique demands. The chapter examines the perceptions of Afghan managers regarding technology management by studying the relationship between the importance of different factors in managing new technology, and the extent to which a manager can control them. An importance-control grid framework is used to isolate individual parameters and to assess these in relation to a manager’s environment. The research highlights imbalances between importance and control, and suggests reasons therefore. Some broader implications for managers are also discussed. This chapter discusses a number of perspectives of knowledge-based technology management in a country where ‘normal’ rules and practices do not generally apply. There is scant literature in this area, and analyses of such settings invariably only consider the macroeconomic situation and the role of governments, the military and international aid agencies. While theorists claim to arrive at answers through logical reasoning, the assumptions and boundary conditions imposed by theoretical models frequently do not take into account the operating context, social phenomena and human factors (Hipkin and Bennett, 2003). In uncertain environments new initiatives should be encouraged since it is difficult to predict the formal learning and experimentation required to utilise and adapt knowledge (Govindarajan and Trimble, 2004). Firms basing their strategy on knowledge and new systems are reliant on employee competence and an exchange of know-how to ensure compliance with design, quality, delivery and cost structures (Lynskey, 1999). Poor educational standards in developing countries retard the pursuit of production competence (Voss and Blackmon, 1996), and there is no speedy solution to this problem since mastery of ‘implicit’ elements in new operational approaches needs a long period of learning (Lall, 1993). The turbulent economic and political environment prevailing in a country such as Afghanistan calls for different management approaches from those in stable, developed countries (Prochno and Corrêa, 1995). Japanese management techniques, with their apparent simplicity and lower capital investment requirements, are initially appealing to countries in any stage of development. However, Grant and Gregory (1997) identify obstacles in their adoption in developing countries: difficulties lie in areas such as essential competencies, infrastructure, education, unionisation, culture and employee attitudes. Shannon (2009) believes that filling the gap in knowledge might enable organizations to deal better with the constrained environments they are likely to encounter in places such as Afghanistan: this is a call for more research in the country and others afflicted by conflict.